The deadline we are typically concerned about in April is the 15th – Tax Day. 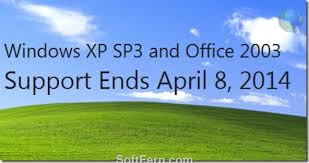 Here in calendar year 2014, business owners, IT personnel, and IT outsourcers are also preoccupied with another deadline, this one on April 8th – the end of Microsoft XP Support. If you have not already heard, on April 8th, 2014, Microsoft will officially end Windows XP operating system’s life cycle. Microsoft has stated that it will no longer sell or support Windows XP and Office 2003. Compliance Issues: For many businesses, continuing to operate XP could result in compliance issues leading to the suspension of certifications, and potential public notifications of an organization’s inability to securely maintain its systems and customer information. Think about what is happening to Target and Neiman Marcus currently. Do you want to run the risk of compliance problems placing your business in legal peril and seriously damaging its reputation? Your business has only one reputation. Don’t run the risk of tainting it by ignoring the XP issue. Upgrade Expenses: As a business owner trying to control costs, are you concerned that an upgrade will be too expensive? If so, please reconsider. Some experts are viewing businesses that continue to run XP as irresponsible, and a serious liability. There is no doubt that problems are going to arise, and they may end up costing your business significantly more than the prudent XP upgrade, not to mention the potential downtime of your operation. Custom Support Available for a Price: Many business owners are in denial about the end of XP, hearing that support will actually remain available after April 8, 2014. True…but beware, as that support will be very expensive, and the reality is that it will be only a temporary band-aid. Please don’t ignore this situation. This is not going to be another Y2K “non-event.” This one is real, and it will bite you if you don’t take action. The interesting thing is that the “XP Lack of Support” also opens up other questions and opportunities for discussion. Microsoft is assuming their XP customers will migrate to Windows 7 or 8. Well, is this the time for your business to look more seriously at Apple MACs? How about Linux? Or do you do away with all of this, and move entirely towards tablets? All of these options come with a list of your standard “pros” and “cons.” It’s never easy. All of these options are viable depending on your circumstances. Now is the time to be talking seriously to your IT provider about this important decision. You can file for an extension if you cannot meet the April 15th Tax Day deadline. There is no such option available for the XP deadline of April 8th. Please take action now. ”Get Off Microsoft XP.” would you like to learn more? Register for our 30 minute webinar held this week to educate business owners on what the risks are and what your options are.